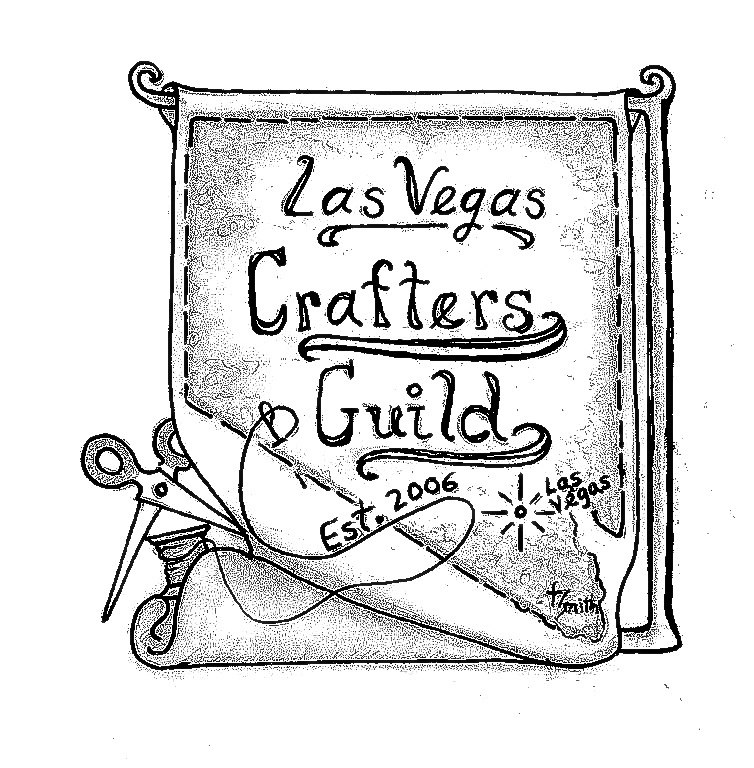 Over the years there has been discussions about creating a new logo for the guild. About 4 years ago, it was changed from the print of 4 hands to a stylized version of the Las Vegas skyline. This year, members decided it was time to make another change. A contest was held and original designs were submitted for voting. Sharon Takahashi, membership/jury coordinator and Merriam Olds, secretary were the administrators for the contest. A total of 9 designs were submitted to Sharon and Merriam. As they were received, each one was numbered and mounted on colored paper. They in turn e-mailed them to members for voting on line and also displayed them at the June meeting. The name of the person(s) who sent in a logo was kept secret. When all the votes were tallied, the logo submitted by Teri Smith, Kristin Petronek’s sister, won the competition. Kristin is another one of our membership/jury coordinators. 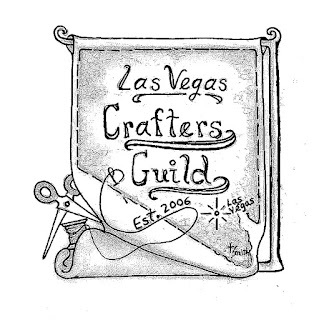 Teri’s design included a tapesty in the shape of the State of Nevada, a threaded sewing needle embroidering “The Las Vegas Crafters Guild” on to the tapestry, a spool of thread and a pair of scissors. As a young girl, I learned quickly that I didn’t always have the money in my piggy bank to buy something new or sparkly. Where is a 14-year old going to wear a crystal necklace in Southern California you ask? I ultimately solved that child’s dilemma by moving to Las Vegas (as an adult). No questions asked! We didn’t have dollar stores when I was young, so I would go with mother to what she called “her department stores” (Salvation Army/Goodwill). I couldn’t just wear a Goodwill item “off the rack” though. I would have to modify it so no one walking down the street would recognize it as their throw away. Believe me, you get pretty creative with dime store clearance items. boyfriend. Three needles, really? I guess it took me too long to finish as I lost interest in the boyfriend and the socks simultaneously. Here’s the backstory about the cake I baked for our July birthday girls, Terry Dana Danhoff and Teri Felts. As the holidays were approaching, my father-in-law, Wilson would ask Mike and me, “What would you like for Christmas?. In unison, we would say pound cake! Wilson made a southern pound cake that was perfect by itself. With the addition of vanilla ice cream, fresh strawberries or peaches, it was heaven on earth. The pound cake would arrive via the US mail in vintage tins or cake takers, sometimes a bit crumbled but always appreciated. 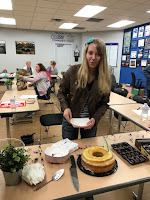 Whether we were in Hawaii or Nevada, we so looked forward to getting the cake in the mail. Wilson is gone now but his recipe is very special. Making it reminds me of him and the pride he took in baking the cake for the people he loved. His employees called him Mr. Wilson when he worked at Lance in Charlotte, N.C. as the cafeteria manager for many years. In his memory and honor, I call the recipe Mr. Wilson’s Pound Cake.